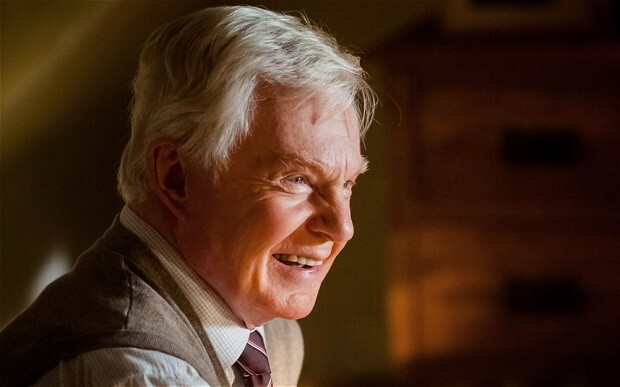 Derek Jacobi, one of England’s most beloved and respected stage actors, has been acting for nearly 60 years and is more in demand now than ever. Having recently completed a scene-stealing run as Mercutio in Kenneth Branagh’s Fellini-styled London stage version of Romeo & Juliet (now showing in cinemas), he is about to begin filming the fourth season of his popular BBC series Last Tango at Halifax. His PBS series Vicious, in which he co-starred with his pal from Cambridge days: Ian McKellen, just aired its finale. And he co-stars in an upcoming film version of the book The History of Love with the Globe Theatre’s Duchess of Malfi (and Bond girl) Gemma Arterton. It is hard to believe that nearly 40 years have passed since Jacobi first came to worldwide attention as star of the BBC/Masterpiece Theatre television miniseries I, Claudius. Along the way he garnered Emmy, BAFTA and numerous other awards for appearances on Frasier and The Tenth Man, and for series like the Cadfael. On film he has been frequently directed by, and co-starred with, his former protégé Kenneth Branagh, including Hamlet, Henry V, and Dead Again; Branagh recently cast him as The King in Disney’s Cinderella. Among Jacobi’s 50 feature films are notable appearances in The King’s Speech, Nanny McPhee, Gosford Park and Gladiator. But it is on the stage that Derek Jacobi’s career is truly without parallel. Spotted as a talented unknown in 1963 by Lawrence Olivier and invited to help found the National Theatre, he is today recognized as a master of Shakespeare, performing in nearly 80 notable theatrical productions in roles ranging from Hamlet to Lear. He won the Olivier Award for his star turn in the RSC’s revival of Cyrano De Bergerac, the Olivier Award for his role as Malvolio in Twelfth Night, and the Tony Award for his turn as Benedick in Much Ado About Nothing. His spellbinding performance as Alan Turing in Breaking the Code led to Tony nominations and BAFTA awards (and with I, Claudius, established him as a prodigious stutterer). One of only two actors – along with Olivier – ever to receive two Knighthoods (English and Danish), Sir Derek shares with friend Mark Rylance the very anti-establishment view that “the Stratford Man” did not write Shakespeare’s plays, appearing in films like Anonymous that explore “The Authorship Question.” The true identity of Shakespeare may be debated for all time, but of Derek Jacobi’s enduring brilliance in bringing the Bard’s words to vivid life while conveying the eternal truths that lie within, there can be no reasonable doubt. Authorship Question, Derek Jacobi, Dido and Aeneas, Kenneth Branagh, Lawrence Olivier, Measure for Measure, Napa Valley, National Theatre, Shakespeare, theatre. Bookmark.